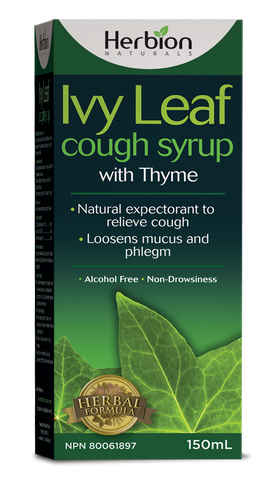 Contains ivy leaf extract, thyme extract and licorice extract well known for their beneficial properties as expectorants (loosen phlegm and clear nasal passages). The product is designed to relieve coughs (dry coughs and bronchial spasm) of the common cold and flu. It also helps soothes sore throats. Alcohol-free, Gluten- free, Nut–free, Dye-free, Non-drowsy..
Ivy Leaf: Ivy leaf contains active ingredients (saponins) with mucolytic, spasmolytic and bronchodilator effects. It is used as an expectorant to relieve cough and typical symptoms associated with bronchitis: increased accumulation of viscous mucus and throat irritation. Thyme: Thyme is a source of various natural flavonoids, responsible for restoration of normal lung function, acting as an antitussive and expectorant. It helps to relieve chest congestion and remove excessive mucus in the bronchi. The essential oils of thyme contain a range of compounds that have anti septic, anti-viral and anti-oxidant effects. Licorice: used as expectorant, emollient, anti-inflammatory and immunomodulatory. Licorice soothe and soften the mucous membranes of the throat and lungs while reducing inflammation and loosening phlegm. The root also helps ease cough symptoms and bronchial spasms. Pregnant and nursing women should consult a healthcare practitioner prior to use. Simultaneous use with other medicines is not recommended without consulting a physician. In case of a missed dose, do not double the dose. Should not be taken if cough is caused by conditions other than common cold and flu. For children <4 years: consult your healthcare practitioner. Store in a cool and dry place below 30°C. Protect from sunlight. Shake well before use.